When it comes to data security and information stored phones (smartphones si tablets) Provided the safest is to use a password (Code) strong (To understand long and 'tortuous') consists of figures. Most of the time, users who use the password to restrict access others on personal phones, Stop at simple passwords consisting mostly of 4 numbers (Minimum number of characters at asked for the password) to ensure that they will remember and they will be able to enter easily when they want to use the phone. But this may be in some cases the disadvantage of users, given that confort password key several times around the same people allow these people to guess the password on the phone. Solution for iPhone users who want to improve phone securityBut do not want to use a strong password (or long) for fear of not looking, is called CodeScrambler. 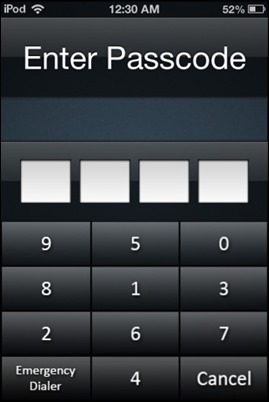 CodeScrambler is a tweak for iOS available from Cydia Store (In order to have access to Cydia must have jailbreak made to device) Which allows users to use short passwords (Even of four characters) and easy to remember, and also increases the security phone stirring keys on virtual keyboard each time it is displayed. Thus the chances of a third party manage to guess the password becomes almost zero. CodeScrambler can be found and downloaded from Cydia priced at $ 0.99, A relatively quite small if you are among those who value privacy and on data security stored in personal phones.